There are few towns in the American West with a richer mining history than Breckenridge, Colo. Brought to life in 1859 to serve the miners in the area, the town all but disappeared in the 20th century. In the last dying gasp of gold mining in Breckenridge, dredging became the only viable way to extract gold that had migrated below the cobblestone of the Blue River. In a process that turned the riverbed upside down, dredges brought up nearly 70 ft of earth as they made their way through the valley in search of gold. They left in their wake piles of cobblestone and sediment decimating the valley floor, which previously was home to an abundance of meadows and wildlife. The natural state of the river was so altered that for up to seven months a year, the river would completely disappear underground in several places. 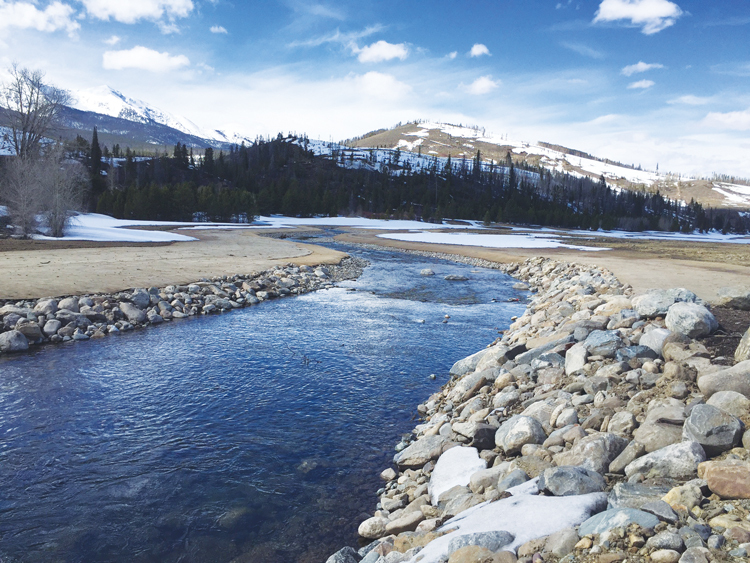 The Blue River Watershed—including several tributaries—is fed by snowmelt in the spring and early summer from the Tenmile Range around Breckenridge. Skiing rejuvenated the town in the 1960s, leading to a revitalization of the watershed in the 1980s with the formation of the Summit Water Quality Committee (SWQC). Comprising several local governments, SWQC is focused on the water quality of Dillion Reservoir, north of Breckenridge, and the river’s tributaries. The importance of the river as a utility of the Summit County communities and a large part of their economic livelihoods was realized, and funding was put into place to restore the watershed to its former pre-mining state. Several problems were targeted: low flows through Breckenridge; loss of the native ecosystem; and unsightly piles of spent cobblestone, sediment and rubble. The town of Breckenridge sought to return the river to its natural pre-mining state. Early restoration attempts tried to improve the flow and aesthetics of the river through the heart of Breckenridge. However, early projects did not use an impermeable liner to keep the water above the surface. Much of the native material, which kept the river above the water table, was washed downstream from the dredging process. As a result, some of the lowest- flowing spots in the river were areas that already had been restored. 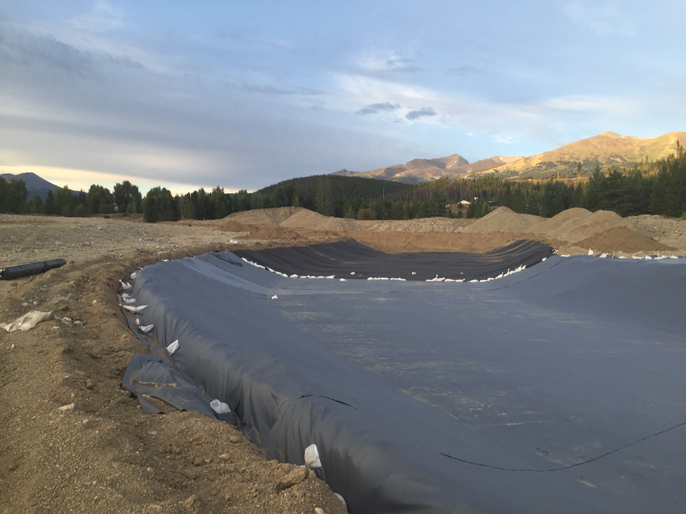 The town of Breckenridge realized that future restorations needed to employ a membrane that could serve as a barrier to keep water on the surface. The material chosen for this project was 30-mil PVC. Known for its flexibility and long-term performance, PVC and protective layers of geotextile have been key elements in recent restorations. PVC also can be prefabricated into custom-sized panels that decrease installation time. 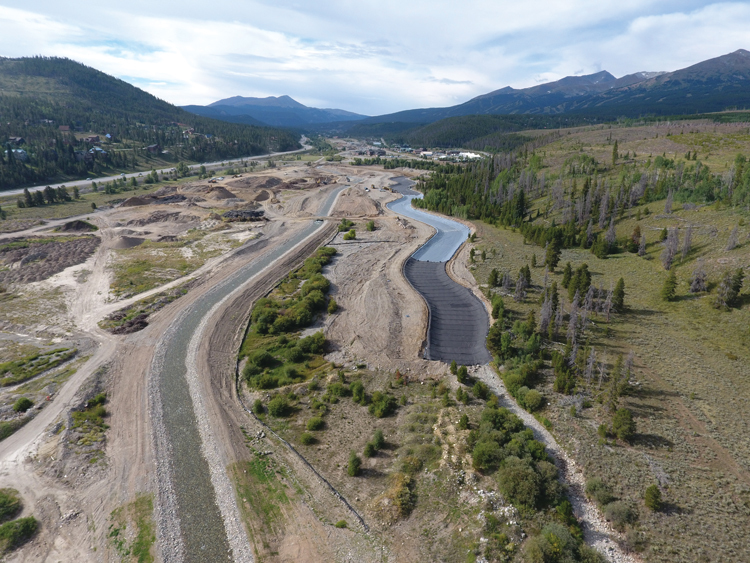 The phase undertaken in the late summer of 2016 involved reconstruction and restoration of approximately 3,000 ln ft of the river, just north of Breckenridge. Work included rechanneling the river into a temporary corridor, earthwork to reshape the original riverbed, installation of the PVC liner, and finally backfilling and revegetating the channel. The lining was composed of 27 30-mil PVC panels, also referred to as “blankets,” totaling 255,798 sq ft. The panels were prefabricated and shipped to the job site prior to installation. Each panel was individually deployed and positioned, then heat-welded together to form a single impermeable layer. Two layers of 6-oz geotextile also were included in the installation to cushion the liner from the subgrade and backfill. Simbeck & Associates partnered with Esco Construction Co., which was awarded the $2.5-million contract from Breckenridge. The project used 30-mil PVC to keep the river water at the surface. Due to the spring snow runoff and the onset of winter, the project was under a tight schedule. Work began as the runoff tapered off in July and had to be substantially completed by the end of October before heavy snow returned to the area. At 9,600 ft above sea level, Breckenridge can experience radical weather patterns. During the liner installation period of Aug. 15 to 23, 2016, the job site received everything from frosty slopes in the morning to torrential hail in the afternoon. At times of heavy rain, the 3,000 ln ft of PVC became a torrent that paralleled the rechanneled river. There was only a small window in the middle of the day in which welding could take place. Morning temperatures reached approximately 35°F and conditions were suitable for welding by midday, but monsoon rain and hail interrupted work and prevented welding every other afternoon. In a handful of instances, erratic winds also caused deployment to be suspended. Partnering with a general contractor familiar with geosynthetics was essential due to phasing earthwork, three layers of geosynthetics, and cover operations over a 1/2-mile stretch. Esco Construction completed the construction phase two weeks early in October 2016. As of April 2017, this section of the Blue River is healthy and will experience higher-than-average runoff. Revegetation will take place in summer 2017. Signs are positive that this approach will carry on to subsequent projects to return the Blue River and other area tributaries back to their former riparian forms. Robert Stafford handles business development for Simbeck & Associates. Stafford can be reached at [email protected] or 970.533.7178. Duff Simbeck is vice president of Simbeck & Associates. Simbeck can be reached at [email protected].